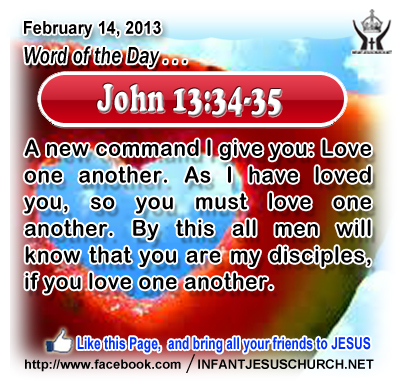 John 13:34-35: A new command I give you: Love one another. As I have loved you, so you must love one another. By this all men will know that you are my disciples, if you love one another. Heavenly Father, we thank you for teaching us to love through the example of Jesus. May our words and actions reflect his love toward people today, tomorrow, and until you bring us all home to you. In the name of Infant Jesus, our Great Example, we pray. Amen. 22"The Son of man must suffer many things, and be rejected by the elders and chief priests and scribes, and be killed, and on the third day be raised." 23And he said to all, "If any man would come after me, let him deny himself and take up his cross daily and follow me. 24For whoever would save his life will lose it; and whoever loses his life for my sake, he will save it. 25For what does it profit a man if he gains the whole world and loses or forfeits himself? The cross of Jesus directs to freedom and victory over sin and death. What is the cross which Jesus commands us to take up each day as his disciple? When our will crosses with his will, then his will have to be done. The way of the cross involves surrender, the sacrifice of laying down my life each and daily for Jesus' sake. What makes such sacrifice possible and "sweet" is the love of God empted-out for us in the blood of Jesus Christ. We can by no means out give God. He always gives us more than we can anticipate or imagine. Are we ready to lose all for Jesus in order to gain all with Christ? Loving Infant Jesus, we give you our hands to do your work. We give you our feet to go your way. We give you our eyes to see as you do. We give you our tongue to speak your words. We give you our mind that you may think in us. we give you our spirit that you may pray in us. Above all, we give you our heart that you may love in us, Lord Jesus, who live and work and pray in us.